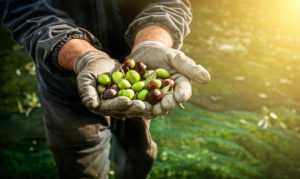 The olive industry has a five-year plan to address key concerns to help empower growers of any size with knowledge and resources to build a more productive and profitable business. The Olive Strategic Investment Plan 2017–2021 (SIP) is an investment roadmap for the Hort Innovation Olive Fund. It outlines the priority areas for R&D investment, helping to guide decisions on projects to be funded by the olive levy. The 27-page document has been developed by Hort Innovation in consultation with growers, the Australian Olive Association (AOA), and the broader olive industry. The plan can be downloaded from the Hort Innovation Olive Fund page at http://www.horticulture. com.au/olive. Greater skills, capacity and knowledge in the industry. The three SIP outcomes ensure all R&D projects are consistent with the agreed industry strategy and objectives, from concept proposal through to project delivery. Every levy-funded R&D project for the olive industry reflects at least one of the three outcomes. How is the SIP used? Project ideas can be submitted by any interested party at any time via the Hort Innovation website, and each suggestion is weighed up through an advisory process to ensure it reflects the agreed strategic objectives for the industry. To assist in this advisory process, Hort Innovation has an olive Strategic Investment Advisory Panel (SIAP). The SIAP is currently comprised of nine levy-paying growers, processors and technical experts, chaired by an independent consultant to ensure the panel operates with good governance. The SIP is used by the SIAP to help guide advice to Hort Innovation in relation to a number of new R&D concepts and ongoing projects as required. The role of the SIAP is to help weigh up new project ideas to ensure R&D investment decisions are balanced and prioritised by the current needs of the industry, and act as guardians for the SIP. Each member of the SIAP has been selected based on skills criteria, with consideration given to large and boutique growers to ensure every sector of the industry is fairly represented in the decision-making process. The SIAP can also provide recommendations to Hort Innovation if they feel a project warrants certain industry representatives to be involved, and provide names of suitable industry contacts. The SIAP is just one part of the advisory process Hort Innovation employs as part of its procurement based investment process for R&D projects. Another key part of the advisory process is the establishment of project reference groups for certain contracted R&D projects. The reference groups consist of industry experts to oversee and provide input to the project service provider throughout the project duration.